Hand-made Holiday . . .
December 17th 2016 Sunday. 1-5p NEW addition ! This is the same class offered thrice. Come to one, or both. Register now..
Settle in, re lax and enjoy the aroma and rhythm of Candle dipping ~ with wax made by local bees. Receive the gift of warmth for yourself, and you may want to invite a family member or friend to join you in this experience. If you wish, start with a short tour the grounds – see enchanting thatched structures & sustainable projects ~ as you harvest some nature materials to decorate your candle holder or matchbox. Feel free to collect items from nature ahead of time and bring them with you. After a snack, we will be making Earthen Candle Holders & decorative Match Boxes from all local and natural materials. mmmmm. 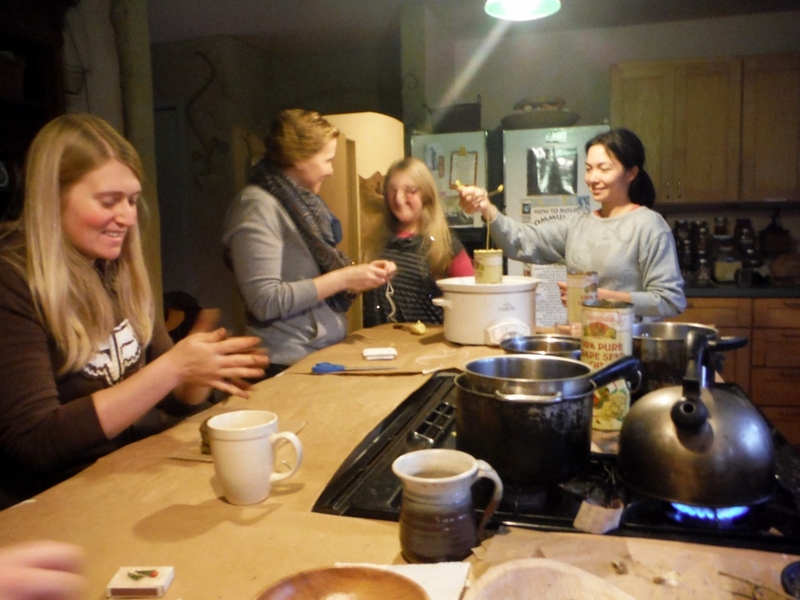 The activities will be held in the cozy kitchen of the main house. Regular Price for each workshop is $30 if paid 2 weeks in advance OR $40 thereafter, with RSVP. Ask about Family-Friendly & Group rates. Class size limited to 12, so consider making a payment now. Includes all materials to make 6 candles, 3 candle holders and 3 match boxes for you to take home. There will be a variety of natural materials from the land that you can use to decorate your projects. You can collect some ahead of time as well, which is FUN ! Wear comfortable old clothes. Wax may get on them. You might want to gather some nature items ahead of time to use as decoration. You might want to photograph the Strawbale Studio or such. Location is at the Strawbale Studio land one hour north of Detroit. Click on link. Register with the link above. If you have further questions contact Deanne by text or phone 248 496 4088 or email ecoartdb at gmail.com. 1:00 -3:15 CANDLE MAKING session. 4:45p – 5;00p Any Burning Questions & Closing. CANDLE-MAKING Agenda. Further details, and where to order materials, at bottom of this page. Introduction; Circle up around the kitchen island counter. What is bees wax? Show an examples: Candle holder, addition of nature items. Matchbox. Start with one candle each, then 2 each. Materials: Crock pot, warming tray, hot plate, wax, pie tins, stirring big stick, spoon or knife to clean edges, tall cans. Crock pot on table with a step ladder for kids. Two dipping areas. Tie wick to stick. Start with one. Get another soon. “Smoothly down, smoothly up” … move. Prime the wick. After first dip, hold the wick straight until it hardens. Let drip, and then tap the bottom if you want. Optional: hang on rack. Size of thumb (3/4 “) Ending time . Breaking up into teams. Can move to the other group. What is cob? Identify earth for natural building, sculpting. Make a very stiff mix. Going taller. Create support. An armature. Letting dry / keeping moist. Speeding up– use fan or heat source. Slowing down. Put in a plastic bag. . Directions: Collage directly on the box, or trace the size on a piece of heavy paper or paper bag, collage, cut out and glue to the box. Leave material to wrap around all edges, or add on a decorative edge paper. Ends can also be covered. Directions: Make a paper stencil from paper. Using a pastel, rub a color patch onto an extra piece of scrap paper. Using a tissue, pick up some of the pastel — like applying rouge or “blusher” — and fill in the stencil onto the card you are making. Grind up pine needles and leaves, and mix with a binder of starch paste and/or pine pitch. Shape to a cone or tiny log, or experiment covering a fine stick. Step 1 Melt the beeswax in the dipping vat, or coffee can over medium low heat by placing the vat in a pot of water. Let the water come to a slow rolling boil and the wax will slowly melt. This is the longest part of this project! I bought several tall tomato juice cans for the project. Step 2 Cut your wick to the length of desired candle stick. Be careful to leave enough wick so you don’t burn your finger tips. You want a little bit of room to work with. What kind of beeswax? You can buy cleaned wax or clean it yourself (see directions below). Some folks also sell a darker wax from the brooder bees. I got it at ½ price and cleaned it myself, as it had quite a bit of “dregs” that settled out when the wax was heated. Wick: sizing & buying Wicks are best if they are the correct size for the candle. If too small, a wick can go out, as the wax floods the wick. Too large, and the wick can burn because it can’t get wax fast enough. For a dipped beeswax taper candle, size 1/0 or 2/0 square braided cord is recommended. I bought wick on the internet from 85ft of 1/O SQ Braid Cotton Wick W142 for $3.60. 18 ply Flat Braid Cotton Wick Yardage: 10 yards from www.alittlecandleandbathshop.com for $2.95 + $4.95 shipping. I haven’t experimented with the flat braid, but bought it because it was “unbleached” cotton. 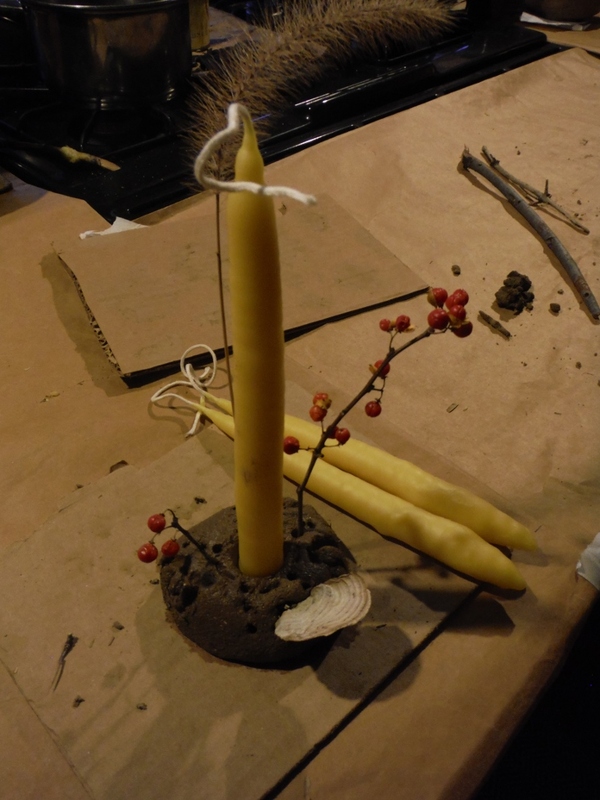 Websites have suggested 3/0 square braided wick for 1/2″ to 3/4″ beeswax candles. Judy from Jody bees recommends 1/0 or 2/0. You could also try local craft stores. Cleaning the beeswax If there are particles in the wax, melt it, and pour through a cloth that is attached to the top of a metal can or pot with a rubberband or wire. The screening material can be a fine cloth, like a sheet, or cheese cloth with a tissue on top. Change the tissue occasionally.